Stir fry boiled jeera aloo is a treat for all foodies. This simple dry sabzi can be easily made at home anytime with little ingredients. Here’s how to make jeera aloo step by step recipe. Potato, the world’s favourite root vegetable, ranks along with rice and wheat as an important staple crop. 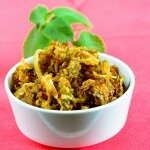 It can be nicknamed as the king of vegetables as it is a must have in every kitchen. They taste the best in any form of cooking. Rich in carbohydrate, this starchy tuberous veggie is an excellent source of many other nutrients like magnesium, vitamin C and vitamin B6. It is also a good source of fibre. Jeera Aloo – Truly Indian – A Feast for Senses! Stir fries or sukhi/ dry subzis as they are famously called in Indian menu are every child’s favourite and every adult’s craving. This particular recipe especially is a hot favourite. An irresistible dish of potatoes is tossed with whole cumin and crushed spices will complement any meal. 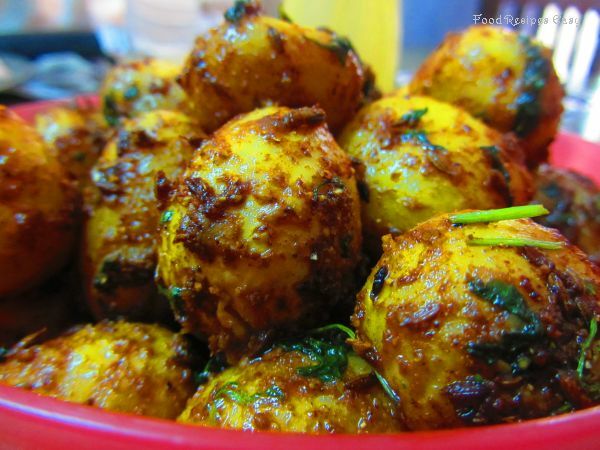 A no onion, no garlic jeera aloo is a very simple, quick and easy to cook dish. 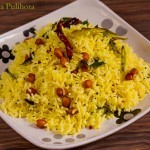 The signature taste of this dish is due to the distinct flavour of cumin. Though a north Indian Punjabi dish, this particular (जीरा आलू) jeera aloo recipe is almost every Indian’s favourite. A real treat for all the potato lovers, this Punjabi jeera aloo sabzi goes well with rice, roti, poori or phulkas. My vote goes to this delicious aloo jeera side dish anytime with dal or sambar or any gravy too. Jeera aloo recipe is almost every Indian’s favourite. Boil the potatoes by adding salt. Peel them and keep aside. In a thick bottomed pan, heat oil. Once the oil is hot, keep the flame to very low and add cumin. Once the cumin starts changing colour, ( if you think the oil is too hot, turn off the flame till you add all the ingredients) add salt, turmeric, chilli powder, dry mango powder, roasted cumin powder, roasted turmeric powder and mix well. Now add the baby potatoes and mix well. Keep tossing till all the potatoes are covered with the spices. Keep tossing for 2 min and add chopped coriander and toss well again. 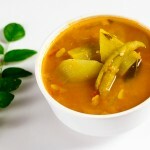 Transfer the contents to a serving bowl and serve hot with rice-sambar or roti. * The beauty of this stir fry boiled aloo jeera recipe lies in preparing the masala that is to be coated around the baby potatoes. I have seen people stir frying the potatoes and then adding other ingredients one by one. 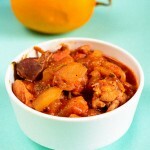 The ingredients get stuck to the potatoes unevenly and will not get the desired taste and texture. ** Coriander powder that is roughly crushed gives a better taste instead of the fine powder. *** You can add chopped garlic if you like to have that flavour of garlic in your jeera aloo. 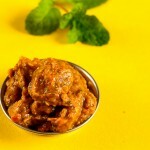 **** Chopped coriander can be substituted with kasoori methi (कसूरी मेथी). 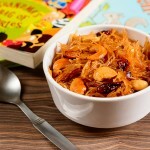 There are few more interesting stir fry recipes – Bharwan bhindi recipe, Beetroot stir fry recipe, Capsicum stir fry recipe, Radish stir fry recipe, Stir fried french beans recipe and Spicy stuffed brinjal recipe.